My beloved alma mater, Notre Dame, is rich with traditions. 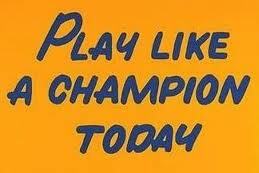 One of the better known is the tradition of football players slapping the “Play Like a Champion Today” sign in the locker room as they head out to the field. Yeah, yeah…maybe the sign has been broken the last few years. One of my favorite displays of Notre Dame tradition comes at the end of football games when students put their arms around each other and sway as they sing the alma mater, “Notre Dame, Our Mother.” Oh, I’m getting all choked up just thinking about it! Then there’s the ND tradition called the Bun Run, which entails a confident crew of young men streaking through the Hesburgh Library during finals week. You wouldn’t believe how many young ladies don’t set foot in the library until that week! As you can tell, I’m a big fan of tradition. And that’s true not only when it comes to Notre Dame, but also with résumés. In the recent past, several nontraditional résumé formats have surfaced. The most common involves leading with “Accomplishments,” “Qualifications,” or “Profile” sections, while burying actual work history at the bottom of the resume. Other novel résumé formats involve tables, charts, text boxes, fancy fonts, color, and — you guessed it — pictures. While updating your résumé to a new-fangled format might be tempting, I’m here to implore you to stick with tradition. If you desire, you can add other basic sections such as Special Skills, Civic Participation, or Publications. Add in a simple, traditional typeface (you can never go wrong with Times New Roman) and a logical, clean format with plenty of white space; and you have yourself a classic résumé! Drop me a line if you want me to email you a traditional résumé template. And drop by South Bend, IN, during finals week if you want some entertainment!